What a year it’s been! In the last 12 months we have seen more of you choosing to use our digital services. We’re committed to building seamless, easy to use and cost effective digital services to suit our different customer needs. We know we needed to get your insight and feedback to ensure your digital service experience right the first time and statistics show you agree! This helps us get the right drivers and vehicles licenced, registered and taxed and on the road, as simply, safely and efficiently as possible. 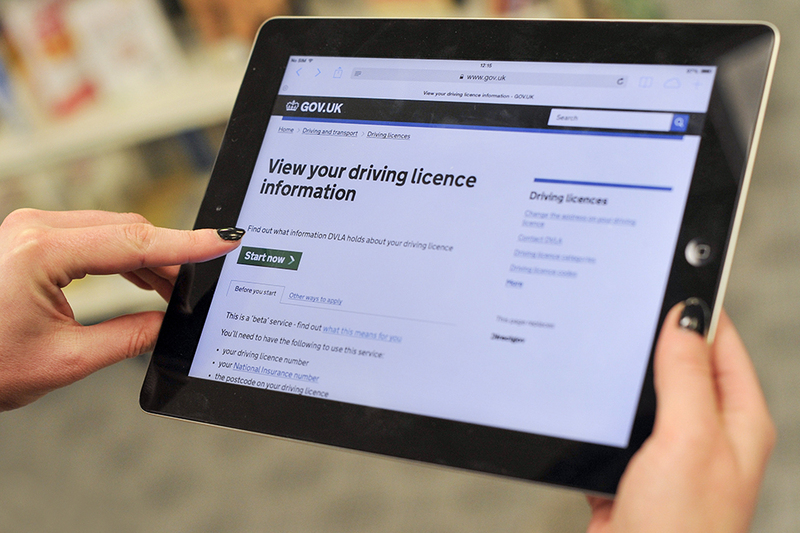 Reducing our online driving licence fees has encouraged more than 4 million customers to apply for a driving licence online – 32% up on this time last year with 70% applying for their very first licence online! Over 33 million of you taxed your vehicle online – 5% up from last year and over 10 million people have taken the opportunity to spread the cost of their vehicle tax by taking up our new direct debit service, saving valuable time and effort. New car sales picked up - meaning we received over 3 million first registrations via our automatic first registration and licensing (AFRL) system. More dealers are choosing to use AFRL - with demonstrations to McLaren, Renault Trucks and TurfCare helping to drive home (excuse the pun) the benefits of using our digital services. March saw our Electronic Driver Entitlement Checking Service draw to a close – before this, enquiries were up 15% on the previous year and we expect to see similar enquiries raised via its replacement, the Access to Driver Data service, in the next financial year. We’ve seen record sales of our Personalised Registrations – totalling over £100 million - an increase of nearly 18% on the previous year. The volume of customers using our View Driving Licence service has also continued to grow to over a million users a month through 2015/16. We had an excellent start to our Personalised Registration online services last year and our new vehicle management services are sure to follow suit, with nearly 30% of customers choosing to tell us that they sold a vehicle online. By using the digital service, any refund of tax can be paid within days instead of weeks, and if you pay tax by Direct Debit, it is cancelled immediately. We’ll let you know via this blog, how these services continue to grow. And finally, our Vehicle Enquiry Service has received nearly 300 million requests for vehicle information – that’s up over 320% on last year’s figure – we don’t need any more proof to provide you with an application program interface (API). We’ll be introducing more digital channels this year so will encourage more customers to transact with us digitally - simplifying our existing services to make them even easier to use is also a priority. Introducing digital channels is helping us to make significant cost savings which we pass onto you, our customers. We do listen and make changes. Even the smallest of tweaks can improve a customer’s experience of using our digital services – and it’s great to know we’re making a difference. Thanks for using the services and here’s to the next 12 months! I am really happy with the way most of the digital services work but as a motor dealer I would like to advise you I am really disappointed with the personalised registration system. Most cars we sell will have had a break in the tax in the last 2 years due to them being in the trade therefore we are unable to put number plates on using the digital system. Please could you advise if you are going to be addressing this in the future? We are aware of this issue and the fact it prevents some customers using the digital service. We are looking at options to address this and will provide an update when we have made positive progress. I have to agree with Julie - really frustrating when I went to sell my car that had only ever previously been in trade. I felt it was ridiculous that I had to submit the paper application and wait longer just because it had quite lawfully sat on a forecourt without being taxed before I took ownership. I was advised that the rule goes back 5 years! Which means that it affects so many vehicles that have gone from trade to 1st owner. I'm now about to put that registration onto a replacement car. I really would appreciate a bit more up front guidance / information about the process? We seem to be expected to find out as we go along - which really isn't good enough. We are told what we'll need - but not what will happen (and in what timeframe)? As a result, I'm really struggling to find out things about the online transfer process. For example, how quickly can I (or should I) replace the plates when I've completed the transfer online? If it's immediately - I need to wait until the car is sitting outside and I also have time to notify my insurer - but if I'm 'applying' for the transfer and need to wait until a new V5C turns up - then I've got a bit of breathing space. All of the 'service' pages are very brief, sparse on information and very much lacking user guides and access to FAQs. Thank you for your feedback. When you retain your registration number you will be given the option of printing off a certificate to allow you to make up the replacement number plates. We are constantly improving the service based on user feedback, and we will take your comments on board. Hi Rohan, thanks - but I don't see how your response relates to the bulk of my comments? Your response seems to the process of retaining a registration number (i.e. that is the term used when taking it off a vehicle - not putting back on)? In my first paragraph I was referring to the fact that I could not take it off online (because of the 5 year tax rule). That may not have been clear given I was following Julie's comment. However, my second two paragraphs were pretty clear I am now putting the registration onto a car, but that the process and timelines about this are not clear - i.e. what happens during the online application and how quickly after the online process must I replace the plates on the vehicle? Using the term 'retain' is confusing if it does relate to the process of putting it back on a car? I thought that was only used when keeping / removing it? What about timelines? How much grace is there under this system? I thought by contacting the DVLA I'd get some clarity - but it feels even asking direct questions gets incomplete information (my third paragraph has been completely ignored). This is pretty naff when we're trying to use your digital service? I'm sorry to be critical - but this really needs to be better - and much quicker than it seems to be moving. We advise customers to change the number plates over as soon as possible. We don't give a specific timeline through the process but would recommend that the changes are made within a reasonable time frame. This will ensure that all information held on record matches the physical vehicle. The number plate can be made up using the eV948 which is produced once an application to put a registration number on a vehicle is completed online. This can be taken to a Registered Number Plate Supplier and is valid for up to 3 days. You can inform your insurance company of the change once you have received confirmation that your application has been successful. If you choose to have the number plate made up and the eV948 has expired, the V5C registration certificate can be used once received by post.